Dunedin’s multi-storey harbourside hotel appears to be dead in the water. Just before this bulletin went to air, development company Betterways sent a copy of a letter noting a memorandum of understanding deadline had passed. The company signed the memorandum with the council earlier this year, amid hopes the $100 million project could find a way forward. 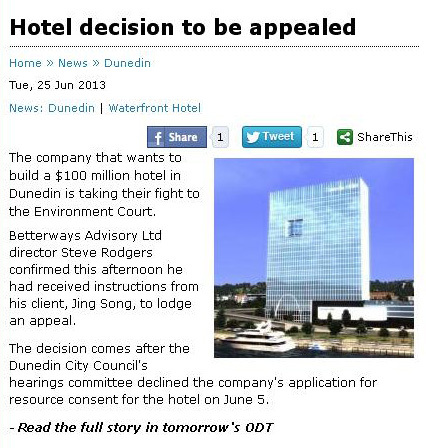 That followed a DCC resource consent committee decision not to allow the hotel. Betterways director Jing Song told 39 Dunedin News the project was over. She said she was left speechless by the council’s lack of communication. Hmmm, wonder how much that just cost the ratepayers??? Or was this just a little timing hiccup because of the Royal Tour. Will Daaave go begging, again. From the start Betterways has been acutely useless at Communication. Was never going to be a sound investment. Jing should be thanking Us. 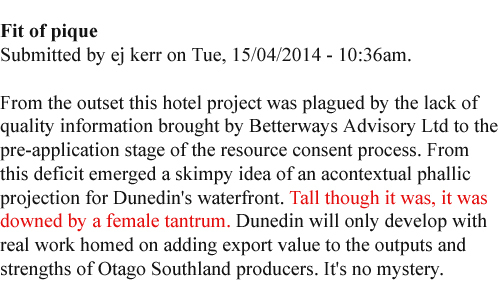 7.1.14 Dunedin Hotel (apartments): Who ARE the developers? ► For more, enter *hotel* in the search box at right. Perhaps the most unfortunate thing about this is the precedent that it sets. The MOU essentially commits the Council to make it happen by whatever means and by whatever council costs are necessary. The ludicrous conflict of interest that this sets up between the Council as developer regulator and Council as developer agent is breezily dismissed early on. If the DCC fails to deliver what the developer wants, then they (we) get to pay all the developer’s costs too. Thereby setting up a situation with considerable motive for the developer to increase the toxicity of this regulatory ‘poison pill’ by inflating these costs a la Carisbrook Stadium Charitable Trust. There is nothing in this document that indicates why it is a special case or anything that defines it as a ‘one off’. This means that the next time a large developer wants to carve up rural zoned land on the Taieri or build an exclusive shooting resort next to the Albatross Colony all they have to do is download the .pdf of this MOU from McPravda’s website, replace Jing Song’s name with their own and present it to Cull and Bidrose with a request to ‘please sign this forthwith’. I can see no legal grounds on the basis of equity of treatment of development proposals by the territorial authority upon which Cull and Bidrose could reasonably refuse to do so. Refusal would therefore promptly lead to court action. █ For more, enter *hotel* in the search box at right. That’s the news or THE MONEY on tonight’s Channel 39 as ODT sprayed saliva over what’s in the newspaper tomorrow. You got it. The Jing-Song-Pings, post-teenagers from hell. HONEY, THEY’RE BACK. THAT was the fear. Please, not the tasteless cardboard box crew again! Their idea of architecture is merely ‘building’ and gross affrontery to Dunedin’s cultural heritage landscape, not SYMPATHETIC CONTEXTUAL DESIGN. So, yeah maybe it’s another anonymous bunch who are too conniving or stupid to front to the good people of this small town. Obviously, they’re known to DCC and the Chamber and those who share their pillows, as it turns out. Lovely! Dunedin’s public treated with ignore by our civic leaders and their honkies yet again. Look how that turned with the stadium project. And why the media release ahead of faces, why do that? Why be so crass, desperate and manipulative? —it feeds directly into the deep distrust held for Dunedin City Council by this community. This is no democracy. Where is the openness and transparency we’ve been promised for SO LONG, and not had delivered ??!! The (blind) Channel 39 announcement came on the heels of a good number of searches at this site lately, in both Jing Song’s, Cao Ping’s and her father’s name — a man known to Michael Hill of Eiontown — no wonder we’re completely off the scent, or was it MISINFORMED. Chinese investors with plans for a $60 million international school have chosen Dunedin as their preferred location, and hope to open a facility within three years. But let’s refresh on the horrific notification and resource consenting process followed by the Jing-Song-Pings for the proposed waterfront hotel (via posts and comments) as a check on what happens for the proposed “school” with Daaave and Ali’s (Jinty got bounced) lack of red tape. Carpet, anyone? 19.12.12 Hearing for proposed hotel – competencies, conflicts of interest? Fear not! More costly settlement is due. There’s the perplexing State Highway 88 Realignment Project for Council to conclude with affected parties damaged by foul-play planning activity, and the new round of ‘proper’ designation! This will make Mr Barnett’s cheque seem like a 4% discount fuel voucher ripped from a mile-long supermarket receipt for your best ever, most hair-raising Christmas shop! Dunedin developer Tim Barnett has received a public apology and a $200,000 payout following a lengthy battle to recover his costs after the Dunedin City Council restricted his ability to develop his harbourside property. 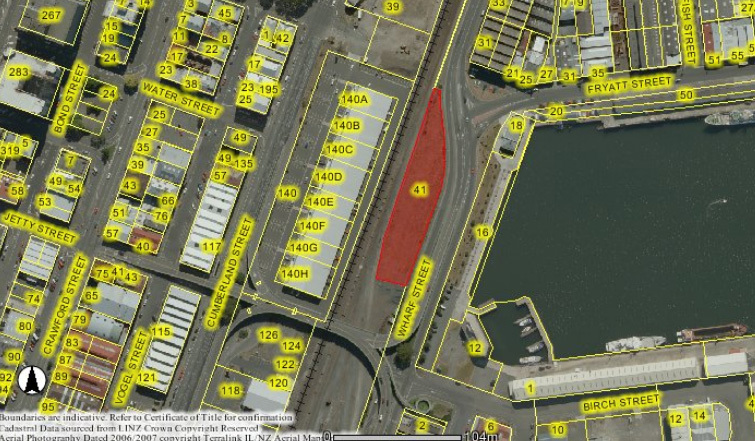 The property, at 41 Wharf St, has since been sold to developers who are hoping to build a 27-storey hotel on it. The $200,000 covers Mr Barnett’s out-of-pocket costs (just under $118,000), the interest on his costs ($41,000) and a contribution to his legal fees during his lengthy attempt to first remove the restrictions on developing the site and then recover from the council the cost of those restrictions. For more on 41 Wharf Street, enter *hotel* in the search box at right.